An arm of the North Sea forming a triangular shape with its apex at the mouth of the Beauly Firth to the north of Inverness, the Moray Firth extends northwards beyond the mouths of the Cromarty Firth and Dornoch Firth to Duncansby Head and eastwards along the Moray and Aberdeenshire coast to Fraserburgh. The waters of the Inner Moray Firth, which includes the Inverness Firth between Inverness and Fort George, stretch out as far as Helmsdale to the north and Buckie to the east and receive the waters of the Rivers Spey, Lossie, Findhorn and Nairn. 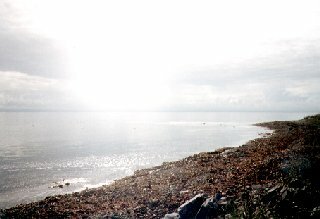 The Outer Moray Firth beyond includes Smith Bank and the Beatrice Oilfield. Bounded on two sides by over 500 miles (800 km) of coastline, the Moray Firth has a diverse array of coastal landscapes, an abundance of wildlife and an economy that thrives on tourism, fishing and the oil industry. In 1996 the Moray Firth Partnership was created, bringing together a wide range of people and organisations with a view to developing an integrated management plan for the complex area of sea, shoreline and coastal hinterland that makes up this so-called 'super-firth'.